Treating Anxiety can often feel like a lonely journey, spending hours with your head stuck in books or reading every article you can off the internet in the hope that it contains something that will help. Anxiety can creep up on you in seemingly random places, steal your peace and send your head into a spin. Perhaps you’re feeling like you’re losing your mind or struggling to find coping strategies. If this sounds like you, I’m glad you’re here. In this post I’m going to share with you my 15 anxiety hacks, little things which you can do to ground yourself, to return to feeling safe and reduce your feelings of anxiety. IMPORTANT NOTE: Firstly if you haven’t done so already please get checked out by your doctor, it’s important to not self diagnose and to give them an opportunity to rule anything more serious out. Once this has been done (its usually some simple questions and a blood test) you can feel comfortable knowing that you’re ok. Anxiety is a normal part of being human, so lets help you understand it better and overcome your symptoms. 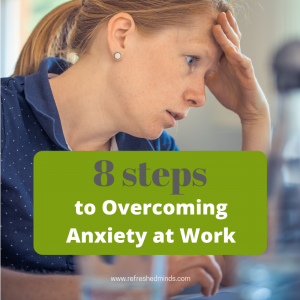 Anxiety is our bodies defence mechanism, I covered this in this blog ‘8 Steps to Overcoming Anxiety at Work’. 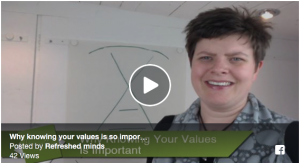 If you haven’t watched the video I shared with you in that blog I highly recommend you do so. So the key to successfully overcoming anxiety is making yourself feel safe and grounded, because we don’t need our defence mechanism if we feel safe. 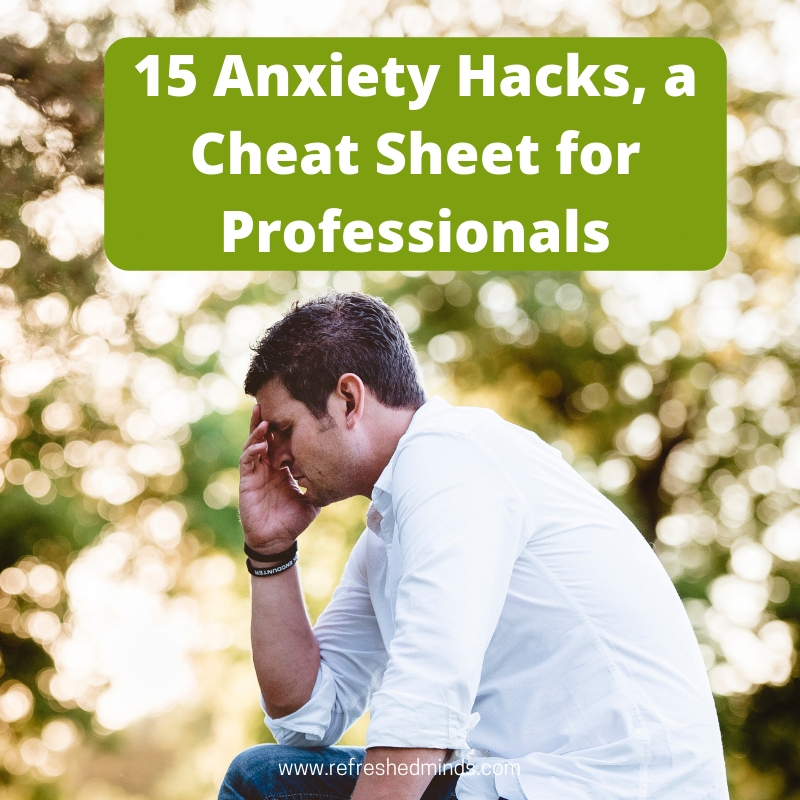 And it really doesn’t matter how you do this, there are many ways, so my 15 anxiety hacks give you 15 different ways which help you to feel good, feel ok about yourself and feel safe no matter where you are. I encourage you to try each of these hacks, to allow yourself to play with them and see which ones would work for you. If it works for you, keep doing them, if not move on, you don’t have to do them all. 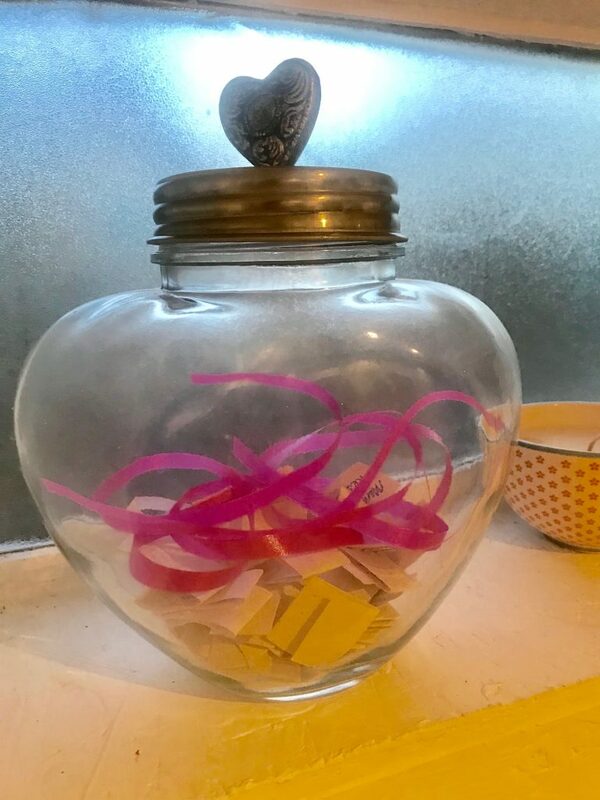 The appreciation jar – This little jar was gifted to me one christmas by my mum. On the little pieces of card in the jar are memories and things which they appreciate about me. Over the last year or so I’ve added things to it whenever I feel I’ve done something well. It sits on my shelf in the Refresh Shed and each day I make a conscious effort to take a moment to notice it. It’s a constant reminder that I am loved and appreciated. A great way to ground yourself. Why not purchase yourself a nice jar and create an appreciation jar of your own. You can ask your friends and family to contribute too. 1 thing you can taste. This is a great grounding exercise which changes your focus and calms your autonomic nervous system. 3. 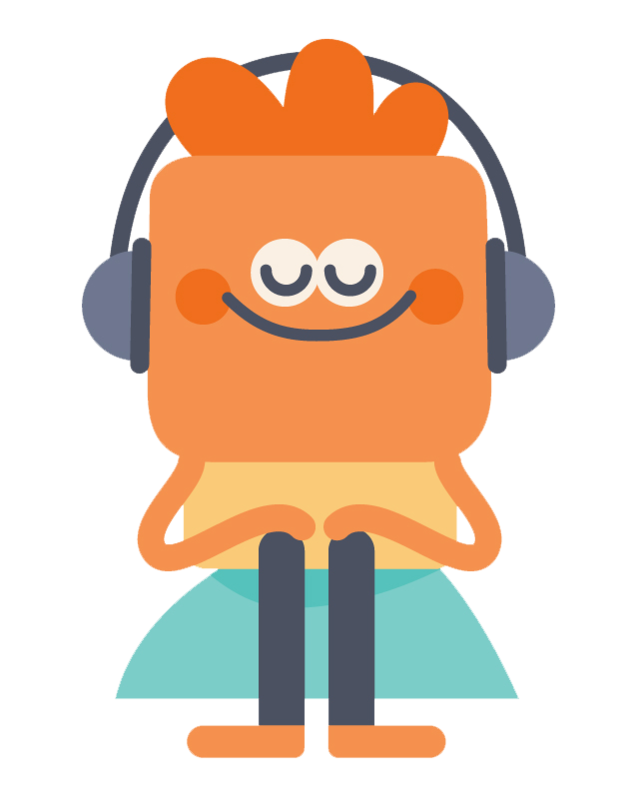 Headspace – This is a great app introducing you to the idea of meditation. It starts really simple with the Basics and its great to have on your phone so you can do it anywhere. Meditation can help you to process your day and bring your awareness out of your thoughts. Overthinking is a classic symptom of anxiety so it’s nice to take your head off for a while and settle. 4. The online insta happy place – Instagram is a place of sharing pictures so why not create a place full of pictures which make you smile and help you to feel grounded, joyful or settled. Create an account and keep it sacred to only things which fill your soul with good feelings. Whenever you feel anxiety spend a little time looking through your Insta happy place and allowing yourself to enjoy them. Our emotions can change in an instant so giving yourself permission to spend some time looking at things which bring you joy will have an immediate impact on your state of mind. 5. The joy of smells – A sense which is often missed in our quest for feeling grounded and safe is our olfactory sense. As humans we find it easy to associate smells with feelings. Don’t believe me? How does the smell of freshly mowed grass or fresh linen make you feel? You can use this natural unconscious process to help you to feel good. Find a smell that you find soothing, one which makes you take a deep sigh of relieve and settle. Carry a bottle of this scent with you and take moments throughout your day to enjoy it. Or use it when you feel anxious to settle yourself. One of my clients found a hand sanitiser which was the perfect smell and couldn’t believe the impact it had on reducing her feelings of anxiety. 6. I know this is true notebook – Often when we’re feeling anxious our thoughts go into overdrive and all sorts of things start feeling like they’re true or important when in reality they’re not. Logically you know they’re not but you can’t seem to stop your mind from overthinking. Sound familiar? If this resonates with you, when you’re feeling more relaxed create an ‘I know this is true’ notebook, just a short list of things which you know to be true eg I have good friends who love me, I am safe and everything is going to be ok etc….Make sure they’re in your words and really resonate with the things which you need to be reassured of. This is a great way to get a good dose of reality in those times you’re feeling anxious. Just take a few breaths, read them and allow yourself to accept that they are true. 7. Describe me exercise – Self-esteem and self-worth plummet the more anxiety you feel. When I feel anxious I feel lost. I feel like I’m losing myself and self doubt creeps in. Because of this it’s important to remind yourself what’s good about you. Ask your friends to describe you in one sentence, collect these together and frame them. If you feel it would be better, ask a friend to gather them for you. That’s what I did and I did one for her. Reading these every day restores my self worth and fills me with those humble yet proud feelings. Sometimes we just can’t see ourselves and it’s nice to realise that this is what people think about you. 8. 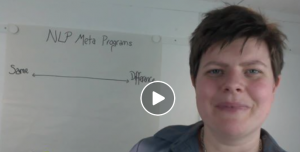 Movement – now I know you might not feel like it as anxiety can be exhausting but movement is our natural answer to the defence mechanism and a natural way to release some of those good feeling hormones. Notice I said movement here, not exercise because it can be anything eg dancing in the kitchen, walking in nature, running up the stairs a few times, I don’t care how you do it, just do something which gets you moving and preferably something which you enjoy. 9. Music – what song makes you smile? What music makes your feet start tapping? What music feeds your soul? Create a playlist and give it a listen. Let yourself feel submerged in it. Let yourself sing loudly and feel free. Music is a great mood changer so use it to transport you to a place where you feel good. 10. Bracelets/beads – These are great for redirecting your focus. Wear something with beads either around your neck or wrist and when you feel anxious concentrate on moving through them one bead at a time. One of my client’s associated each bead with a statement and she found this calmed and settled her. This isn’t just for girls!! You can get some nice man jewellery made of beads. 11. Be honest with someone – How often do people ask, ‘how you are’ and you reply with ‘I’m fine’? Like somehow admitting it will open the flood gates and crumble what’s left of your self composure or embarrass you in-front of your peers. Anxiety becomes this secret that you keep to yourself. Hiding it adds to your feeling of not being safe, not being accepted and not being ok. So, find someone to be honest with and open up to them. You may be surprised by how therapeutic getting it off your chest can be. This can be anyone, a partner, a friend, a relative or a professional, choose someone you trust. 12. 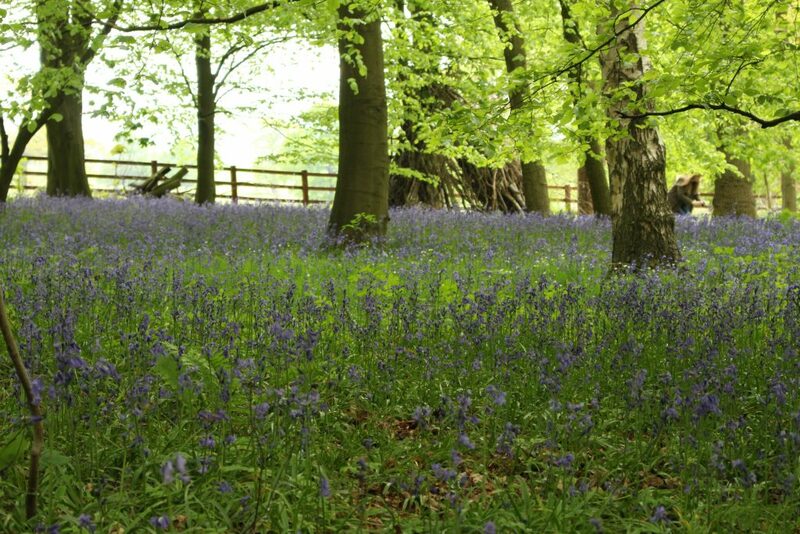 A mental calm place – Where to do you feel comfortable, safe, calm and at peace? Just closing your eyes and bringing that place to mind can have a calming effect on the autonomic nervous system. It’s easier to create this place when you’re feeling relaxed and really give yourself permission to enjoy it. See what you see, feel what you feel, really connect to this place in whatever way feels good for you. I personally love the feeling of the woods especially when the flowers are out but you choose whatever place you would like. Creating it when you’re relaxed means that when you’re feeling anxious it’s easier to recall. Note down your experiences and then when you’re feeling more relaxed look back through them and analyse them with a rational mind. Rationalising your thoughts can help change the way you think about things which in turns changes the habits and patterns which stir up anxious thoughts and feelings. 14. 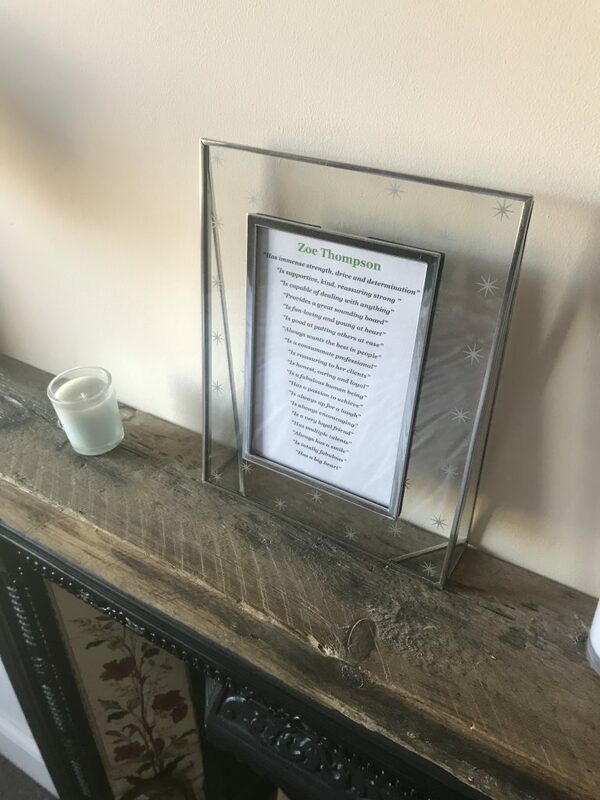 The cookie jar – This idea what shared by Nathaniel Birkett from the Swim Specialist at the Chakra Corporate Mental Health Awareness Day we spoke at together. There are times in our lives when we do things which make us proud or make us laugh uncontrollably. Store these all in a mental cookie jar so when you doubt yourself and feel like you’re falling apart you can dip into your cookie jar, remember these moments and recharge your mental energy. I loved this idea, a simple anxiety hack which you can use any time, any where. Give it a go and see how it works for you. What you’d put in your mental cookie jar? 15. Get some help – If your pipes had burst you’d call in the plumber, if you’d broken your leg you’d go to hospital. If you are struggling reach out and get some help. Professionals have got all the tools and knowledge and not only that but they give you support and guidance. Stop struggling along by yourself and call in the experts. If my style resonates with you and you’d like to chat, reach out and book a complimentary mindset review, its always a valuable chat and even if I can’t help I’ll endeavour to point you in the right direction. WOW there’s a lot of ideas there, I hope you find at least one which you like. All of these are techniques I’ve used either personally to help me stay mentally strong or with clients over the last 7 years. They get some amazing results for helping to treat anxiety or for building your self-esteem. Give them a go and let me know which are your favourites and how you get on in the comments below. Zoe is a Mindset Therapist specialising in providing Anxiety Treatments, Stress Solutions and TMS Therapy. Some of her recent work has been in supporting recovery from RSI, Migraines, IBS and many other symptoms of anxiety and workplace stress.